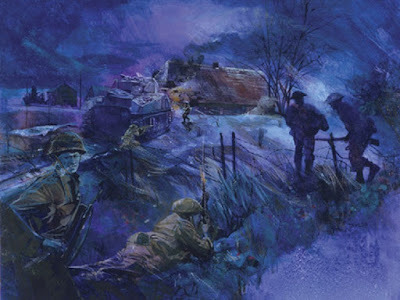 "In Holland, on the night of 25th/26th February,1945, the 1st battalion, The Queen's Own Rifles of Canada, launched an attack on the hamlet of Mooshof, to capture ground which was considered essential for the successful development of future operations. Sgt. Cosens' platoon, with two tanks in support, attacked enemy strong points in three farm buildings, but were twice beaten back by fanatical enemy resistance and then fiercely counter-attacked, during which time the platoon suffered heavy casualties and the platoon commander was killed. 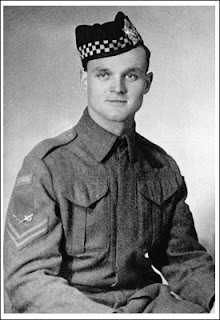 Sergeant Cosens at once assumed command of the only other four survivors of his platoon, whom he placed in position to give him covering fire, while he himself ran across open ground under heavy mortar and shell fire to the one remaining tank, where, regardless of danger, he took up an exposed place in front of the turret and directed its fire. After a further enemy counter-attack had been repulsed, Sergeant Cosens ordered the tank to attack the farm buildings, while the four survivors of his platoon followed in close support. After the tank had rammed the first building he entered it alone, killing several of the defenders and taking the rest prisoner. 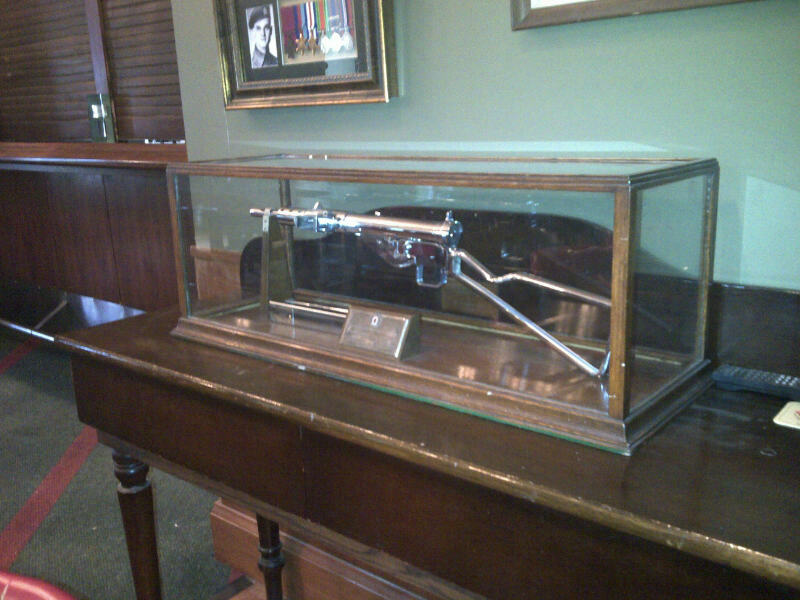 Single-handed he then entered the second and third buildings and personally killed or captured all the occupants, although under intense machine gun and small arms fire. Just after the successful reduction of these important enemy strong points, Sergeant Cosens was shot through the head by an enemy sniper and died almost instantly. The outstanding gallantry, initiative and determined leadership of this brave N.C.O., who himself killed at least twenty of the enemy and took an equal number of prisoners, resulted in the capture of a position which was vital to the success of the future operations of the brigade." From Sgt. 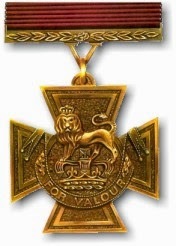 Cosens' Victoria Cross citation, awarded on May 22, 1945. Sgt. 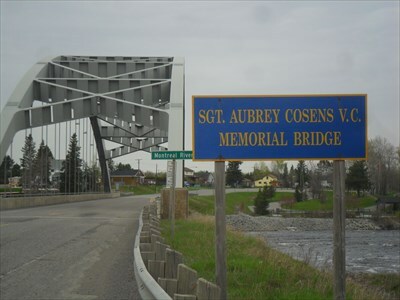 Aubrey Cosens VC Memorial Bridge in Latchford, Ontario. Cosens' Sten SMG at the Moss Park Armour, Toronto.